This interesting surname is of early medieval English origin, and is a locational name from a place thus called in Hertfordshire. The placename was recorded as "Baldac" in the 1168 Pipe Rolls of the county, and was named in commemoration of the city of "Baghdad", known in Middle English, Old French as "Baldac". The derivation of the name, according to Arabic etymology, is said to mean "city of Dat", Dat being the personal name of a Mohammedan monk. The town was founded in the 12th Century by the Knights Templar, who held manor there, and they named it from the Old French form of Baghdad. During the Middle Ages, when migration for the purpose of job-seeking was becoming more common, people often took their former village name as a means of identification, thus resulting in a wide dispersal of the name. Thomas Baldac is noted in the 1280 Subsidy Rolls of Worcestershire. 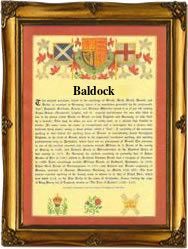 In the modern idiom the surname can be found as Baldick and Baldock. Ralph (de) Baldock was archdeacon of St. Andrew's, Holborn (1276); dean of St. Paul's (1294); and Bishop of London (1306 - 1313). A Coat of Arms granted to the family depicts a black eagle displayed with two heads on a shield divided in quarter erminois and ermine, on a blue chief engrailed three gold escallops, the Crest being on a green mount a greyhound sejant, the dexter paw resting on a silver escallop. The first recorded spelling of the family name is shown to be that of Hugh de Baldoca, which was dated 1185, in the "Records of the Templars in England", Bedfordshire, during the reign of King Henry 11, known as "The Builder of Churches", 1154 - 1189. Surnames became necessary when governments introduced personal taxation. In England this was known as Poll Tax. Throughout the centuries, surnames in every country have continued to "develop" often leading to astonishing variants of the original spelling.